The Opioid epidemic is one of the most damaging health crises of our era. Even overall life expectancy is now in decline, in part from the spike in deaths caused by Opioids, according to a staggering report by NPR in December.2 You probably know someone that has been affected by it. One of the major factors driving the Opioid abuse epidemic is the frequency with which these potent and addictive drugs are prescribed by doctors. Through a series of mistakes, aggressive marketing, and poor judgment among medical professionals, Opioids like Oxycodone were deemed ‘safe,’ and distributed like candy to unsuspecting patients. The results were predictable, but shocking nonetheless. Patients visiting their doctor for chronic back pain or taken to the emergency room after a mishap on the softball diamond, ended up addicted to a pernicious drug. The cycle, aided and abetted by drug companies, marketing firms, and often unsuspecting doctors, has exploded into an expanding public health nightmare, and a terrifying rise in addicted individuals. Yet despite the awareness at hand, it is a problem we will be combating for decades to come, and at a cost of many billions of dollars. After a recent procedure for a root canal, one patient refused a prescription for hydrocodone no less than five times, and they still included the prescription in the take-home paperwork. With medical errors now the third-highest cause of death in the United States,3 incidents like this can further erode our faith in those entrusted with our welfare. The Hippocratic oath has become the hypocritical. Something has to change! 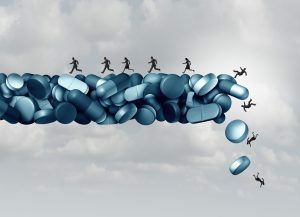 Consequently, the National Drug Control Policy (@ONDCP) is taking political leaps towards the government analysis to the issues surrounding the Opioid crisis point and by providing evidence towards the need to increase the use of non-drug options as a first line of care to find safer and more effective solutions to addiction treatment recovery and prevention. Not really changing one drug for another. Part of the change that is needed is cultural and it starts with the way we approach our well-being and lives as a whole. We have to get away from the idea that there is a simple, one-step solution to problems. As consumers, we have been trained to believe that somewhere out there is a quick fix whatever ails us. Pain has a place in the human organism; it can be a warning or a deterrent to injurious conduct. How we deal with pain is a choice. Rather than succumbing to pharmaceutical to turn off the pain, choose to attack the cause of pain and address the problem at its root. Instead of masking what our body is trying to tell us, we need to listen, and take action that addresses the underlying issue. To claim our longevity birthright, we have to make smart, holistic choices about our health and the way we live our lives each day and stop chasing the illusory notion that we can fix ourselves without investing in ourselves. We will be delving deeper into these important and complex issues and the way they are affecting our society and our lives in a future article. For now, if you or someone you love is struggling with Opioid dependence, know you are not alone. There is help, and the first step, reaching out, is the most important one. Currently, organizations like the Florida Chiropractic Association are holding panel discussions at their National Convention on this issue in front of thousands of doctors to create awareness amongst Doctors of Chiropractic who can provide real solutions and more importantly prevention on the ground. Organizations like the Chiropractic Society of Wisconsin has provided a video on the Opioid Crisis. Our world is in desperate need of new health care and community leadership. We believe it is important to move away from being a drug culture to a new culture that nurtures human potential through every phase of life. It is certainly true that if you’re going to live to 80, 90, 100 years and beyond, then you are going to have to not die. If you are going to enjoy quality years, then avoiding drugs except as a very last resort is optimal. Chiropractic care can provide a corrective answer for pain and all types of health problems. The Critical Transition to Lifestyle Care can help you function healthy and drug free throughout your lifetime. Schedule an appointment for you and your family members. Don’t be afraid to get the help you need for yourself or a loved one in order to break your addictions. Make healthier choices today and enjoy a sensational century. 100 Percent for 100 Years! 1 Report: All of U.S. Saw Opioid Overdose Rises, U.S. News & World Report, March 6, 2018. 2 Life Expectancy Drops Again As Opioid Deaths Surge In U.S.; NPR, December 21, 2017. Visit our YouTube Channel to watch more great videos from Stowe Chiropractic. And if you’re interested in learning more about the 100 Year Lifestyle, visit the 100 Year Lifestyle channel on YouTube.